Yosef Wolde-Mariam & Tshawe Baqwa of MADCON, blend singing and rapping in a unique and harmonious way. Their musical style is a retro-urban-mix with influences from funk; soul and hip hop with additional elements and vibes from reggae, Latin and African to complete the finished product. Live in concert MADCON delivers an energetic musical showcase with a full band on stage. The experience is unique for the European music scene and is best described as a mix of Outkast, The Roots, The Black Eyed Peas and Gnarls Barkley. MADCON quickly established themselves in the Nordic music industry as "everybody’s favourite rappers", and they created a remarkable hype supporting for various international superstars like: Destiny's Child, 50 Cent, Alicia Keys, Wu-Tang Clan, Xzibit, Saian Supa Crew, Clipse, Redman, and Busta Rhymes. Additionally, MADCON supported the last official European tour with the legendary Gang Starr. MADCON released their first single "God Forgive Me" in 2000 with Virgin Records. However, their first commercial breakthrough was with long time collaborators Paperboys with the hit single "Barcelona" in 2002 with Bonnier Amigo. 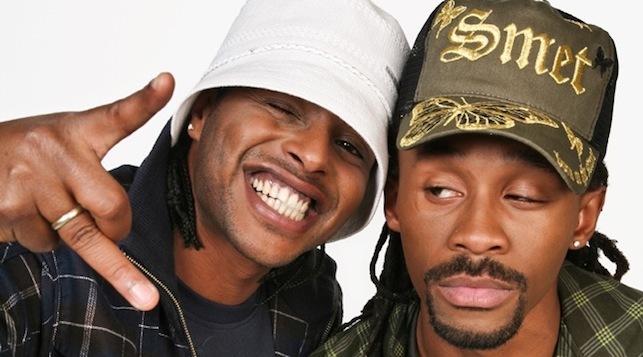 Their first official album, "It's All A MADCON," was released back in 2004 (AA-Recordings/Bonnier Amigo) and won them a Norwegian Grammy and several other awards. In 2005, MADCON became TV-personalities on the Nordic music channel “The Voice,” while continuing to grow their music in the studio. The show “The Voice of MADCON” became a huge success for both MADCON and the network, showcasing the behind the scenes life of Norway’s favorite rap stars. In late 2007, Tshawe was invited to join the hugely popular "Dancing With The Stars" TV-show in Norway, and against all odds, he won! When the media hype was at its biggest, MADCON released their brand new single “Beggin’,” a cover of an old Frankie Valli classic, and it immediately became a smash hit. “Beggin’” became the first urban track in Norway to make it all the way to the top of the sales and radio charts. Their second album "So Dark The Con Of Man" was released in Europe in December 2007, and sold gold in 3 hours, and then platinum in 3 days. The album was then released in the United States, on Next Plateau/Universal/Republic. The single “Beggin’” worked its way to 7x platinum status in Norway, becoming one of the biggest hits of all time in the Norwegian charts and making strong waves throughout Europe. Interest for this fresh and exciting talent from the Nordic territory was gathering in Europe, and after several negotiations MADCON's label, Bonnier Amigo, signed a licensing agreement with SonyBMG for Europe. “Beggin’” was then released in countries all over the world such as Germany, France, The UK, Austria, Russia, Greece, Poland, Italy to name a few. The single quickly became a smash hit on the European charts.